- Publisher Well known for their innovative writings on churches and money, the Ronsvalles of empty tomb, inc. team up with Professor U. Milo Kaufmann to present their newest work: a method for making people comfortable discussing the difficult issues of linking money with values. Based on congregational small-group discussions that create support and trust, the method helps individuals identify their fears and worries, as well as their attitudes on stewardship and support of the church. A series of questions leads participants by steps to new and increasingly probing conversations about these issues. Individual readers can also use the book. 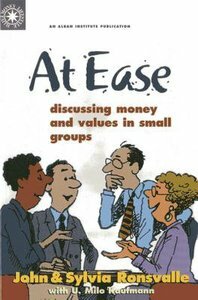 Well known for their innovative writings on churches and money, the Ronsvalles of empty tomb, inc. team up with Professor U. Milo Kaufmann to present their newest work: a method for making people comfortable discussing the difficult issues of linking money with values. Based on congregational small-group discussions that create support and trust, the method helps individuals identify their fears and worries, as well as their attitudes on stewardship and support of the church. A series of questions leads participants by steps to new and increasingly probing conversations about these issues. Individual readers can also use the book.